We all know that making it through medical school is one of life’s greatest challenges, but is it worth the long hours and sleepless nights? And are medical students able to maintain some semblance of a social life? Can they even, pray tell, be successful and –– married? 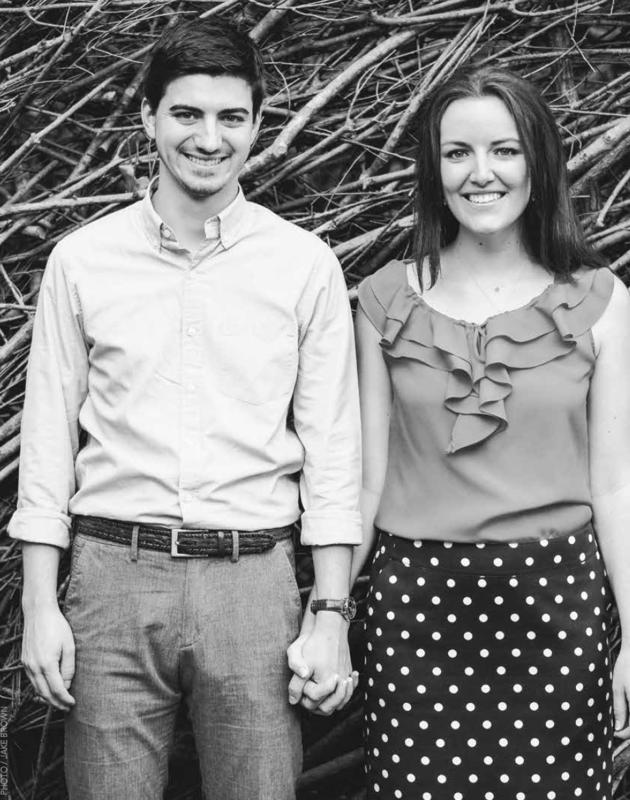 To find answers to these and other questions, we turned to one of Baylor’s best and brightest couples, who are both attending Baylor College of Medicine (BCM) in Houston. Taylor Kohn, a University Scholar graduate from Baylor in 2013, was a Fulbright Scholar who is now in his second year at BCM. 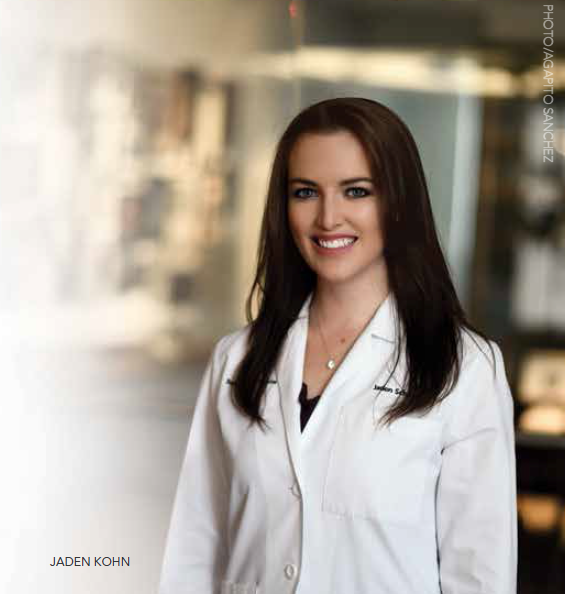 His wife, Jaden (Schupp) Kohn, was a Rhodes Scholarship finalist who graduated from Baylor in 2012 with a degree in biochemistry and medical humanities. She’s in her third year at BCM. Before we talk about our experiences in medical school, allow us to tell you a bit about our history together. We met at Baylor University as freshmen when we joined the pre-health honor society, Alpha Epsilon Delta. During our junior year, as student leaders of the same organization, we began dating but swore that dating wouldn’t interfere with our professional ambitions or our choice of medical school to attend. One year later, in January of our senior year, we had both been accepted to and decided to attend Baylor College of Medicine in Houston together. However, a few months later, Taylor was selected as a Fulbright Scholar to spend a year engaged in research at the University of Manchester in the United Kingdom before starting medical school. So, Jaden started her first year of medical school at BCM while Taylor moved to the UK to study Alzheimer’s disease in a laboratory. New environments, the stress of school and research and living 6,000 miles and six time zones apart challenged our relationship, but we learned more about one another and ourselves than ever before. And over Christmas break that year, Jaden visited Taylor in the UK and we got engaged! After returning to the States, Taylor completed his first year of medical school while Jaden finished her second year. Then, we got married in Jaden’s hometown in Colorado this past summer before heading back to Houston to jump into another year of studies. Now, let’s talk about medical school. The first 18 months at Baylor College of Medicine are spent in the classroom, learning via lectures and in small groups. Halfway through the second year, students transition to learning in a clinical setting on “clerkships” or “rotations,” in which they participate as a member of the healthcare team and start putting faces and stories to the diseases so laboriously studied in the classroom. 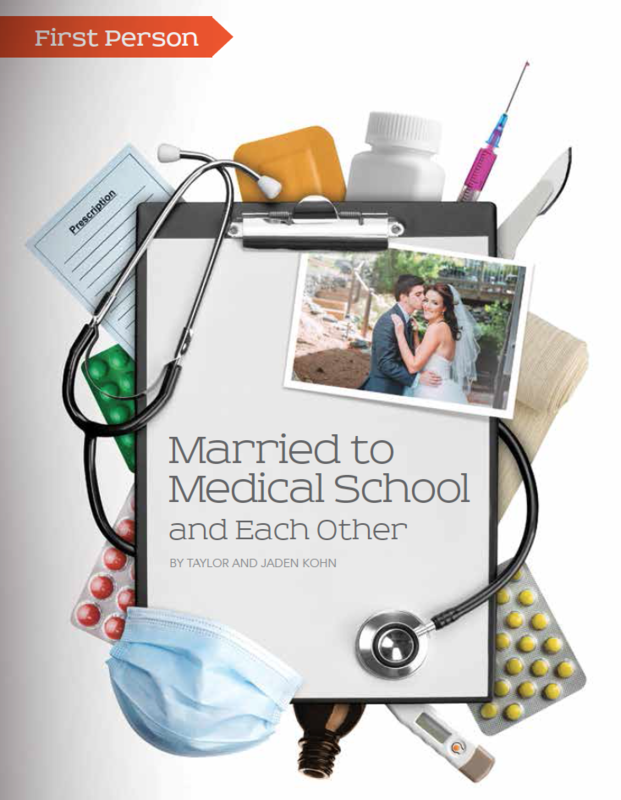 Being a couple while in medical school –– dating, becoming engaged and getting married –– has been an exercise in teamwork and alternating responsibility and support for one another. Some weeks, when one of us is studying extra hard for an exam or is particularly busy at the hospital, the other will make an extra effort to cook food for the both of us, run errands or do other small things to help the other. While there is always something more to learn or study, we have discovered that is vital to take a step back and relax and be intentional about our time with one another. These are the times when we will grab a bite to eat or take a walk through the park or just lay on the couch –– exhausted, but talking and sharing together. Even in these rare moments of rest, medical school seeps through. We share about the cool things we learned in class, the meaningful interaction we had with a patient, or the amazing surgery we saw that day. We are both so grateful to have someone who understands the challenges and the joys of medical school and who can help and encourage us each step of the way. So, exactly what has studying at Baylor College of Medicine been like? Since we’re at different points in the process, we’ll take turns talking about our past year (2014-2015). Sitting in a large classroom with 180 classmates, a wave of information washes over us about the different signaling pathways of the cerebellum in the brain, as we calmly and methodically take notes and synthesize the information. For the next several hours, we will learn more neurologic pathways and then more the next day, and still more the following week, and somehow more and more over the following months. As first-year medical students, the material is never hard –– rather, the challenge is waking up every morning to face the same wave of new information while trying to retain and ingrain into your mind what you have already learned. However, the moments of wonder and insight make up for the endless slog. One such moment of awe came in gross anatomy lab during our first semester. Upon removing the heart of our cadaver and dissecting out its various valves, I was blown away that these seemingly flimsy valves had opened and closed with absolute consistency more than 3 billion times in our cadaver’s lifetime! The human body is truly stunning. Outside of the classroom, it is incredible how much my classmates and I learned and grew that first year. If they had instructed us to memorize all those complex neurologic pathways on the first day of medical school, we would have despaired and not even known how to begin. Ten months later, there we were –– calmly stuffing more information into our brains than we had ever believed we could. Medical school slowly stretches you until you are able to learn and do more than you ever thought possible. 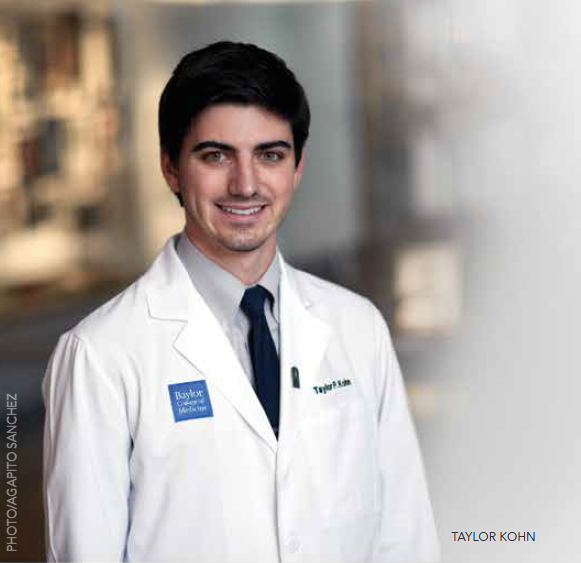 During my second year of medical school, I completed the “Big Two” clinical rotations –– medicine and surgery. Medicine was an ocean of information, requiring me to learn to synthesize knowledge in a new way to arrive at a diagnosis and plan for patients with an enormous variety of illnesses. Medicine was thoughtful and vast, and often slow. Medicine was when I realized the joy, and the pain, inherent in developing relationships with patients and their loved ones. One example of this occurred when we worked very hard to coordinate services on behalf of a patient, to ensure he would receive a biopsy that could determine his course of treatment and possibly save his life. He was frustrated and homesick and did not want to stay for the biopsy, but I talked with him and discovered he could be bribed to stay if I brought in some fresh pineapple the next day. I never felt more fulfilled about my purchases at the grocery store. All the specialists coordinated so he could receive his biopsy, and he was able to go home to enjoy living while he waited for the results. He returned unexpectedly a few days later, and passed away that night. His wife was devastated and I was crushed –– we had tried so hard, and it seemed futile. But the sweet words of his wife, letting us know how much we had meant to her family as we cared for her late husband, renewed my commitment to caring for people in their sickest and often darkest days. In contrast to medicine, surgery was focused and operated at a full run –– arriving at 4 a.m., leaving at 7 p.m., and feeling like I had barely blinked and the day had passed. I loved the precision of the operating room and the feeling that there you could, in a few hours, actually fix a person’s problem. I watched as the surgeons saved the life of a 10-month-old baby by transplanting a new liver into his tiny body. It was demanding, but incredible. Just as the first 18 months of pre-clinical curriculum stretched and challenged us to learn more than we thought we ever could, the past 10 months of clinical curriculum have challenged me to grow both intellectually and personally, as I learned the intricacies of caring for human lives. So proud of both of you!!! Wow! I’m inspired by the two of you. Baylor is privileged to have you. I am continually impressed with your dedication and commitment. You GO Taylor and Jaden! Such an awesome couple, how blessed you are to inspire others with your journey! Jaden – I know your dad, Jay! He is dear dear friend of mine… And boy is he proud of you and Taylor. He forwarded me your story and I so enjoyed reading about you! Keep up the good work. Congrats and what you’ve already accomplished in your young life. Amazing! A very interesting read! I am impressed with your dedication to each other and your new profession. It won’t be easy, marriage and medical degrees, but I know you will do it and do it well! Taylor, I am a button buddy of your mom. She is a fantastic lady.